The Power Position swing trainer guides you into all the different "power positions" that promote greater distance and better accuracy. The dual-colored barrel helps you monitor your swing plane while the molded grip teaches proper hand placement on the club. Great for strengthening the key golf muscles with its added weight. The Power Position also helps to guide a square club face at impact with its exaggerated club head. If you have any questions regarding the Sklz Power Position Golf Training Aid, please give us a call, we would be happy to help you with any questions you may have. 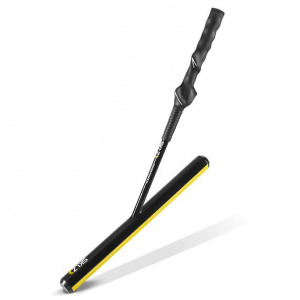 Write an online review on the Sklz Power Position Golf Training Aid, and share your thoughts with others.